On June 5, 1942, 2nd Lt. Martin Taub of Newark, New Jersey, was piloting a P-40E (41-24782) over Rhode Island when his aircraft crashed in Narragansett Bay, killing him. It was reported that he was the second serviceman from New Jersey to loose his life in an aviation accident over southern New England that day. The other pilot was Lt. Richard M. Stafford, of Summit, N.J. who was killed in a crash at Windsor Locks, Connecticut. 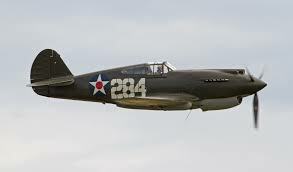 Stafford’s plane was a P-40F, (41-13765). As he came in to land the plane, he overshot the runway, and then turned sharply towards the hangars and flew over them. Witnesses said the engine was running smoothly, but laboring at low RPMs. Suddenly the engine started popping, and without sufficient speed to land on a runway, the aircraft craft fell from the sky and landed upright before catching fire. At the time of his accident, Lt. Taub was assigned to the 66th Fighter Squadron. At 7 p.m. on June 24, 1942, 2nd Lt. Herbert Chester Chamberlain, 23, was scheduled to take off from Hillsgrove Army Air Field in Warwick, Rhode Island, in a P-40E-1 aircraft, (Ser. No. 41-24990), for a routine training flight. 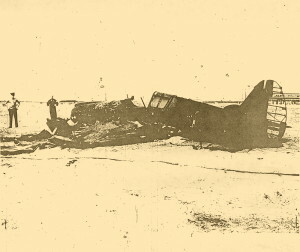 Just as the aircraft left the ground, the engine quit, and the plane crashed into some woods near the edge of the field. Lt. Chamberlain was transported to a hospital in Providence where he succumbed to his injuries. The accident was blamed on mechanical failure of the aircraft. Lt. Chamberlain received his pilot’s wings April 29, 1942, and at the time of the accident he was assigned to the 66th Fighter Squadron stationed at Hillsgrove. He’s buried in Long Island National Cemetery, in East Farmingdale, Long Island, New York. To see a photo of Lt. Chamberlain in uniform, see www.findagrave.com, Memorial # 480983. Lt. Chamberlain had survived another aviation accident only a few days before his death. On June, 16, 1942, he was piloting a P-40E, (Ser. No. 41-25161) over Norwood Massachusetts when the aircraft experienced engine trouble. He attempted an emergency landing at Norwood Airport, but crash landed in a swampy area near the edge of the field. He was uninjured in that accident.